Hours: 8:00 a.m. to 5:00 p.m., Monday to Friday. Honorable John Jarvey and Honorable Thomas J. Shields presiding. The U.S. Southern District of Iowa includes 47 counties located roughly in the southern half of the state. 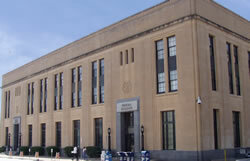 The District headquarters is in Des Moines with Divisional Offices in Davenport and Council Bluffs. The Davenport Divisional Office includes the Iowa Counties of Clinton, Des Moines, Henry, Johnson, Lee, Louisa, Muscatine, Scott, Van Buren, and Washington. The Davenport Divisional Office hears federal proceedings and naturalization ceremonies. Other services in the Davenport Federal Building have moved to new locations. They include: Social Security, IRS, Post Office, Wage & Hour, and the United States Public Defender. Please check the phone book Blue Pages under U.S. Government for contact information.